Sunday 21st September 2014 – The last of my training walks. Well off I went this morning on the very last of my training walks for my Shine Walk. I’ve really enjoyed wandering around, although some places have been a little scarier than others. It was lovely to be able to walk on a path for all of my walk today which is something that I’ve not done for a while. Usually at some point I go off road and have to walk towards the cars and bicycles. It was a gentle walk today, only 18 miles or so. 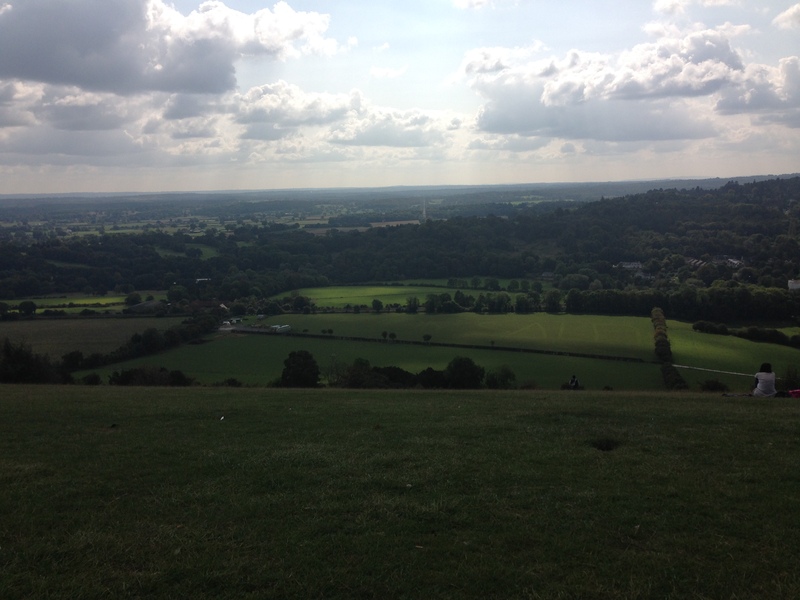 I left ringing and walked to the View Point at the top of Boxhill. On the way I walked past a farm, with cows and various other animals. Lots of farmyard smells, especially from a massive pile of cow manure, wonderful for the garden. 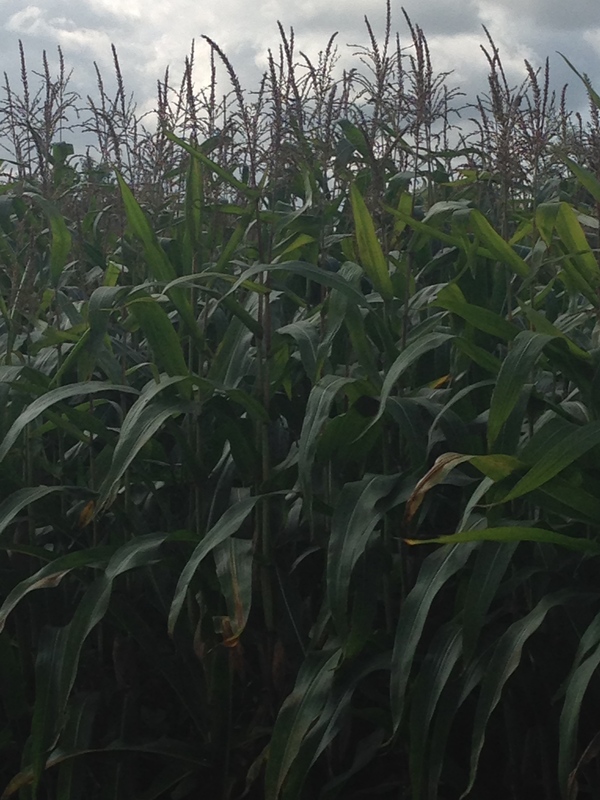 They also grow Sweet Corn on the farm, which is all looking rather wonderful. Now when I grown my corn on the allotment, I grow it in a little block, like you’re supposed to, but my block is usually 4 plants by 6 plants. On the farm, they grow their corn in a block, but it’s a whole field full. I don’t think the photo does it justice, but it looked amazing. A whole field of Sweet Corn. It looked so beautiful. Now the walk to the bottom of Boxhill is lovely, but the walk up the bridleway is another thing entirely. Now I’ve walked this same path before, but had to stop half way for a brief moment to guzzle some water, but this time I was determined to make it further, if not to the top without stopping once. There were more people venturing their way up and down the path today. At the very bottom I was over taken by 2 men riding bikes up the bridleway. They over took me at the beginning, but then I was walking at the same speed that they were cycling, so I reached the top only seconds after they had. I was hoping that maybe they’d stop half way, then I would over take them, but they didn’t. I stomped up at my rather brisk pace, and over took many people on my way. “Excuse me” was a frequent phrase of mine! I’m not sure if they thought I was mad at walking at such an alarming speed, but hey ho, I was on a mission. I finally arrived at the top, all red faced and rather hot. I walked to the viewpoint to sit down to have my lunch. I found a rather lovely spot, and ate my sandwiched and other lunch things I bought to nibble. The view from the Boxhill View Point. After resting for about 20 minutes, I visited the ladies, and then walked back home. The walk home was shorter, but seemed longer. I arrived home just after 3pm, and Mark had a glass of wine waiting, and a cup of tea. I took both to the bath, and then got in my pj’s. I think I’ve trained enough for the 26.2 miles that I’m walking on saturday 27th – sunday 28th September. I don’t think I could have done any more. I start at Southwark Park at 9pm, and am hoping to finish at Old Billingsgate about 4am on the sunday morning. I’ll let you know how I get on. A massive THANK YOU to everyone who’s sponsored me, you are all FABULOUS!! I’ve raised over my target, which is amazing, take a look here!! This entry was posted in Uncategorized and tagged Box hill, Cancer Research, claire's allotment, National Trust, OLD BILLINGSGATE, Shine Walk, Southwark Park, Sweet corn, View Point. Bookmark the permalink.